There's no way I'm going to wade headlong into the contretemps over the awarding of the 2009 Nobel Peace Prize. It hardly makes sense to me to engage in a debate about whether Barack Obama does or doesn't deserve that honor when there appears to be no consistent basis for determining who the winner of the prize should be. Instead of arguing about the worthiness of this or that recipient we should be focusing our questions on what the Nobel Peace Prize is - or should be - about. Take this quote from the Nobel committee chairman, Thorbjorn Jagland, for starters. The question we have to ask is who has done the most in the previous year to enhance peace in the world. Perhaps this is an accurate statement of some committee guideline or other - I don't know - but it strains credulity to suggest that the prize is awarded based primarily on events of the previous year, given that a cursory examination of the list of past peace prize recipients indicates everything to the contrary. 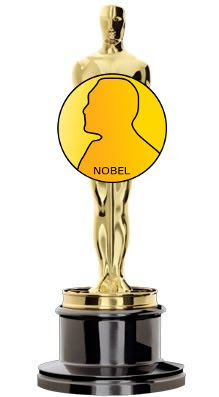 Admittedly, the qualification for nomination for the prize is dictated by a submission deadline, and the prize itself is associated with the year of its award, but to confine the "eligibility" based on the calendar year is to make the Nobel Peace Prize resemble the Oscar competition. Certainly some advances in peace are of such moment that they demand almost immediate recognition, but seldom are the implications of diplomatic breakthroughs, for instance, fully realized in such a short period of time. The comparison of the Nobel Peace Prize Committee and the Academy of Motion Picture Arts and Sciences is apt in other ways. Award of the Oscars is, nominally, based only on the talent and craft of the competitors. But, of course, the politics - of both the films and the actors under consideration - influence the process and jockeying by contenders for last-minute year-end theatrical release - a brazen acknowledgement of the limited attention span of members of the Academy who vote for the awards - has become an accepted tactic. The peace prize selection seems sometimes to be subject to similar caprice, driven by perceived political opportunity and late-breaking news. Now, of course, the work of the Nobel Peace Prize Committee is necessarily political, at times even pointedly so. The award of the prize to Burmese opposition leader Aung San Suu Kyi in 1991 was, in part, motivated by the immediate political interest of assuring her safety by drawing international attention to her struggle and the threat posed by the Myanmar State Law and Order Restoration Council (SLORC, a disaster of an acronym, if there ever was one). Using the prize for this kind of humanitarian intervention, though, stands in stark contrast to sending abstract messages of approval for the changing of administrations in the United States, for example. The Oscars can be forgiven for their stepping outside strict guidelines - to the extent they exist - for their selection process. The Academy is, after all, a large association of member artists, and the results of their vote are little more than an collective expression of personal opinions. The Nobel Peace Prize Committee is another kind of beast entirely. It is a small, deliberative body, and we have every right to expect that their choices be based on a well-considered - and clearly stated - philosophy. To that end, I would recommend that the committee take a careful look at their history of "successful" awards, that is those that have stood the tests of time and repeated scrutiny. One category, which appears early on in the history of laureates, includes ambassadors and political leaders who, through their bold action and diplomatic prowess, have worked to end ongoing armed conflicts. Anwar Sadat comes to mind in this regard. Then there are the institutional winners, such organizations as the International Committee of the Red Cross or Amnesty International or Doctors without Borders, who have created and sustained non-governmental programs that labor year in and year out, over periods of decades, in the furthering of human rights and human dignity. But, lest the Nobel Committee lose sight of their mission and hopelessly dilute the "brand" of which they are, in some sense, only temporary custodians, they must remember to turn their spotlight routinely on heroic individuals - not government officials - in the struggle for peace and justice; Martin Luther King, Jr, Albert Schweitzer, Desmond Tutu, Rigoberta Menchu, Nelson Mandela are examples. They constitute the central pillar of the peace prize. Their work - in the face of persistent personal danger and in spite of repeated personal trials and disappointments - reminds us of the fact that the struggle for peace is essentially an individual struggle, one in which we can all aspire to participate. So, first and foremost, the Nobel Committee should see announcement of the peace prize award as an opportunity to elicit from us, not hair-splitting debate, but admiration and hope. This is, ultimately, what the Nobel Peace Prize is about. Of course, there will always be controversial choices, but people will maintain confidence in the selection process as long as it not considered arbitrary and, instead, is consistently grounded in recognizing the lesser-sung champions in the struggle for a better world. The Nobel Peace Oscar by Marc Merlin is licensed under a Creative Commons Attribution-No Derivative Works 3.0 United States License. Great comments Bro Marc and better yet no scientific words that I don't understand. Well said Marc. I totally agree. Thanks.